This past Saturday, August 11th, 2018, presented a transcendently commemorative close to 2018’s Mostly Mozart Festival. 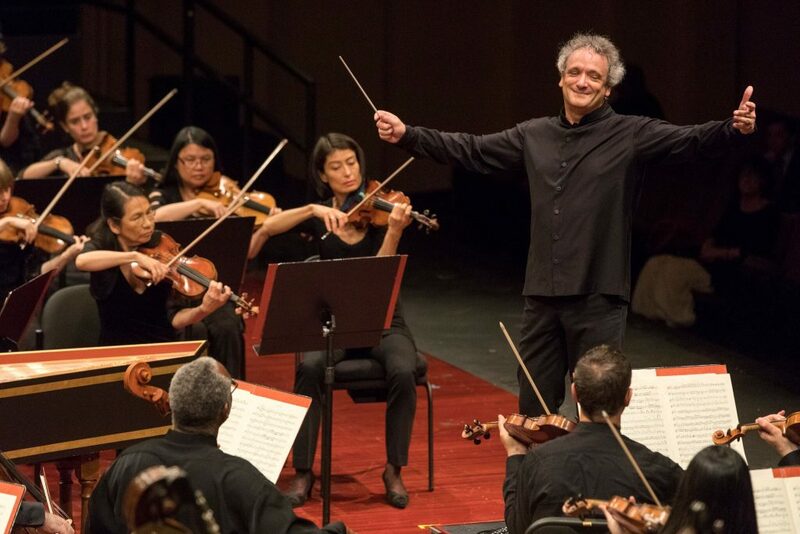 With esteemed conductor Louis Langrée at the helm, the Mostly Mozart Festival Orchestra and Concert Chorale of New York partnered with an accomplished group of soloists to bring three of Mozart’s most beloved works to life: Meistermusik, Piano Concerto No. 21 in C major, K.467, and Requiem. The evening opener, Meistermusik, served as an abbreviated sample of Mozart’s contribution to masonic music, with an approximate length of six minutes. As mentioned in Christopher H. Gibbs’ program notes, the composition was structured around a Gregorian chant melody related to the Lamentations of Jeremiah. The soft, sustained woodwind section underscored a dancing string line with romantic longing, creating a subtle tone for the evening. The men of the Concert Chorale of New York additioned sustained, tonal harmonies that nodded to the musical brotherhood feel of the Freemasons. Pianist Stephen Hough was the indisputable star of the evening with his heartfelt, creative rendition of Piano Concerto No. 21 in C major, K.467. From memory, his fingers danced through each movement, seamlessly listening to, blending with, and escalating the orchestral movements as needed. Brilliantly apparent was not only his deep understanding of the musical structure, but his commitment to new, soaring life within his original cadenzas. At the close of the piece, Hough was greeted with thunderous applause and a standing ovation from his audience. After his third return to the stage to receive much deserved, unending appreciation from his audience, he offered Schumann’s Träumerei, from Kinderszenen, Op. 15, No. 7 as an encore. The final programmed piece, Requiem, was written in the last year of Mozart’s life. The 48 minute Mass for the Dead explores the breadth of the composer’s talent, nodding to his choral, chamber, concertante, and symphonic styles in turn. The movements vary from mutedly frantic to grandiosely harbingering, illuminating the vocal dexterity of the chorus. From intricate rounds to soft harmonies, the Concert Chorale of New York evened their sections with distinct intonation and playful storytelling. A balanced quartet of soloists included Jodie Devos, soprano, making her U.S. Debut. Devos’ delicate, pitch perfect sound nicely collaborated with mezzo Jennifer Johnson Cano’s warm, rich animation. Tenor Andrew Stenson floated lusciously with bass-baritone Ryan Speedo Green’s deep-toned vibrato and easy purity of sound. The Festival Orchestra drove devotedly from one movement to the next, featuring each section in turn. The floating, dexterous strings were underscored by the tempo keeping bass line. The lyrical winds exchanged notated glances with the percussive brass. Conductor Langrée led the complete ensemble with aplomb, using animated, full-body movement to draw each rise and fall from both the chorus and the orchestra. After much applause, the evening ended with an intriguing musical tag: Mozart’s final 8 composed bars brought to life, an excerpt of Lacrimosa (bars 1–8), from Requiem, K.626. The Mostly Mozart Festival fully represented the spectrum of Mozart’s musical contribution, adding a much appreciated musical revue to New York City’s summer.